During June 2012, a salvage excavation was conducted west of Modi‘in (Permit No. A-6540; map ref. 196720–7132/646452–755; Fig. 1), following the discovery of ancient remains during an antiquities inspection prior to construction. 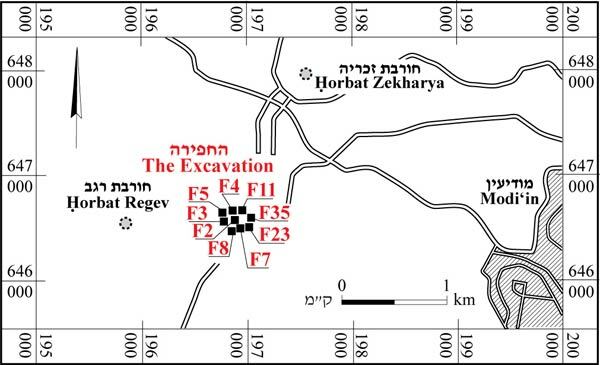 The excavation, undertaken by the Israel Antiquities Authority and underwritten by the Kal-Gav Company, was directed by R. Avner, with the assistance of T. Shabi (area supervision), Y. Amrani (administration), R. Assis (preliminary inspections), M. Kunin and Y. Shmidov (surveying and drafting), A. Peretz (field photography), R. Bar-Natan, D. Sandhaus and Y. Rapuano (ceramics) and I. Lidski-Resnikov (pottery drawing). Additional assistance was rendered by A. Re’em, A. Shadman and A. Rothstein. 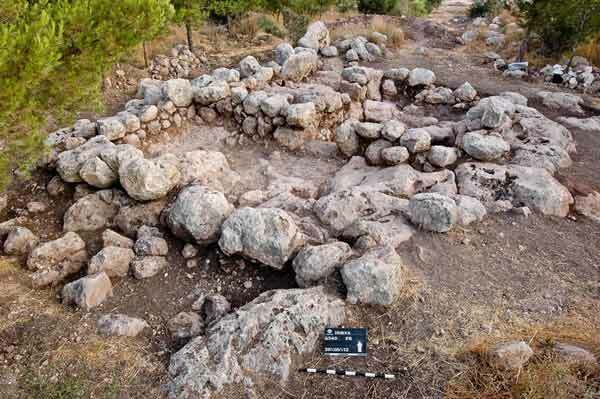 The excavation was conducted on the slopes of a low hill, c. 200 m east of Horbat Haruba. 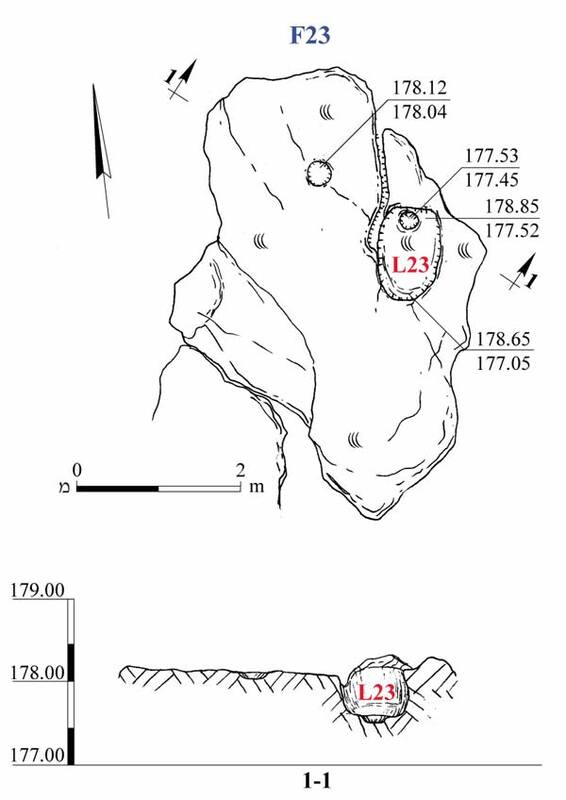 Remains of a building (F8) and rock-hewn installations were exposed, including an underground cavern (F3), cisterns (F7, F11), an installation (F23), winepresses (F2, F5, F35) and a burial cave (F4). Walls and farming terraces were among the remains of agricultural installations identified in antiquities inspections, carried out prior to the excavation. Building F8 was rectangular (length c. 11 m, width c. 9.3 m; Figs. 2, 3) and built of large undressed stones set on the bedrock. In places where the bedrock was low, the walls were built on a foundation of earth with small and medium stones meant to level the construction surface. The walls of the building were preserved two courses high (width 0.8–1.2 m). The building’s remains were found covered with the collapse of the walls. Three rooms were identified in the northeast, northwest and south after the collapse was removed. 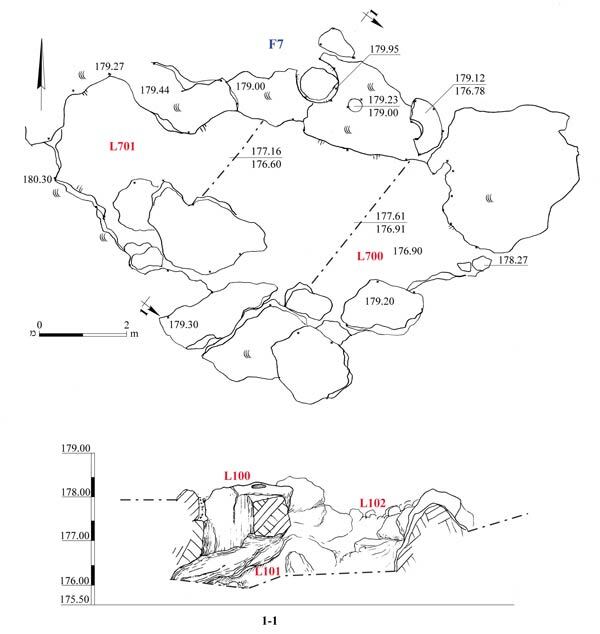 The room in the northeast (L804) was delimited by three walls (W82–W84) and included remains of an earthen floor in the opening in W82 (width 0.6 m) and a cupmark was hewn in the northwestern corner (c. 0.20×0.25 m, depth 0.07 m). The room in the northwest (L800) was delimited by three walls (W81–W83). The level of the bedrock was higher than the earthen floor in Room 804 and potsherds dating to the Hellenistic period (Fig. 4:3–6 below; fourth–first centuries BCE) were found on it. The room in the south (L802) was also delimited by three walls (W80–W82) and might have been open to the east. Underground Cavern F3 was exposed c. 40 m north of Building F8; it was rock-hewn and became wider toward the bottom. The fill inside the cavern (depth 1.28 m; Figs. 5, 6) was excavated, but yielded no datable finds and the excavation was not completed. This might have been a cistern. Cistern F7. The cistern (max. length 10.1 m, max. width c. 5 m, exposed depth 3.3 m; Fig. 7) was revealed c. 17 m east of Building F8. Its ceiling had collapsed and its opening (diam. 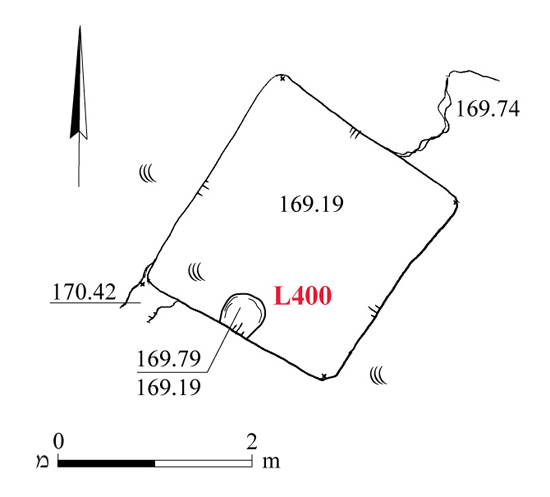 0.45 m) was located in the east. A stone that was probably used to plug the installation was discovered c. 1.9 m from the cistern’s opening. No datable finds were discovered in two probes excavated alongside the cistern and down to the level of friable white limestone. Cistern F11. 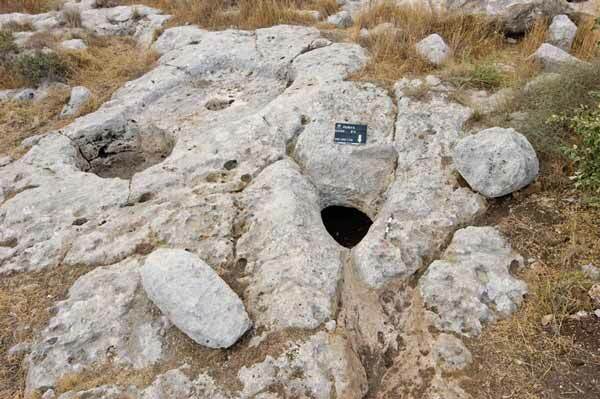 The cistern was rock-hewn and its opening was located in the southeast (diam. 0.9 m; Fig. 8). An underground cavern led to the cistern’s opening (length 5–7 m, width of the cavern 4–7 m, width of the opening c. 1 m). Cat and sheep bones, which cannot be dated, were found in a probe excavated next to the cavern (3×4 m). A cupmark (diam. 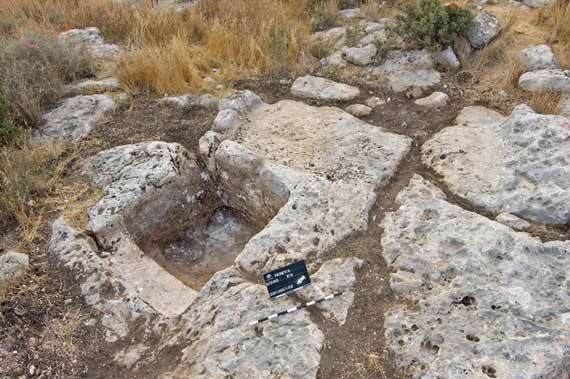 0.5 m, depth 0.5 m), in which water jars might have been placed, was discovered c. 2. 5 m from the cistern’s opening. Other cupmarks were discovered c. 2.8 m west of the opening (diam. 0.35, depth 0.2 m) and c. 4 m to the east (diam. 0.3 m, depth 0.22 m). Installation F23 was exposed c. 45 m east of Cistern F7. A cupmark (diam. 0.27 m, depth 0.2 m; Figs. 9, 10) and an elliptical basin (width 0.65–1.10 m, depth 1.33–1.60 m), c. 0.9 m apart, were discovered. A depression (diam. 0.22 m, depth 0.08 m) was hewn in the bottom of the basin. Winepress F2 was exposed c. 2 m from Cistern F3. It consisted of a treading floor (length 1.25–2.00 m, width 1.9–2.2 m, height 0.15 m) that sloped toward the north. The must drained into a collecting vat (diam. 1.50–1.95 m, depth 1.07 m) in the northeastern corner of the treading floor. A rock-hewn depression (diam. 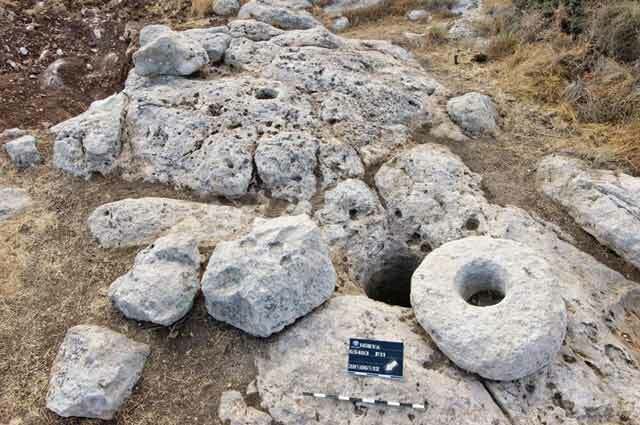 0.9 m depth 0.3 m) was discovered near the center of the treading floor; it might have supported a beam that was also used in the production of olive oil. Winepress F5 was exposed c. 30 m northwest of Cavern F3. In the northwestern side of the treading floor (4.0×4.2 m, height 0.1 m; Figs. 11, 12) was a channel that ended in two steps (width 0.5 m, height 0.6 m), which drained the must into a collecting vat (L500; 1.80–2.17×1.85–2.05 m). Another channel (length 0.2 m, width 0.25 m) was discovered in the southeastern corner of the collecting vat, which might have drained must from another treading floor that was not excavated (its presumed size 1.5–2.0×2.0–2.4 m). Winepress F35 was exposed c. 180 m northeast of Winepress F2. It included a treading floor (length 5 m, width c. 4.85 m) in whose southwestern side was a hewn channel (length 0.3 m, width 0.12 m, depth 0.07 m; Fig. 13) that drained into a circular collecting vat (diam. 1.25–1.35 m, depth 0.58 m). A cupmark (diam. 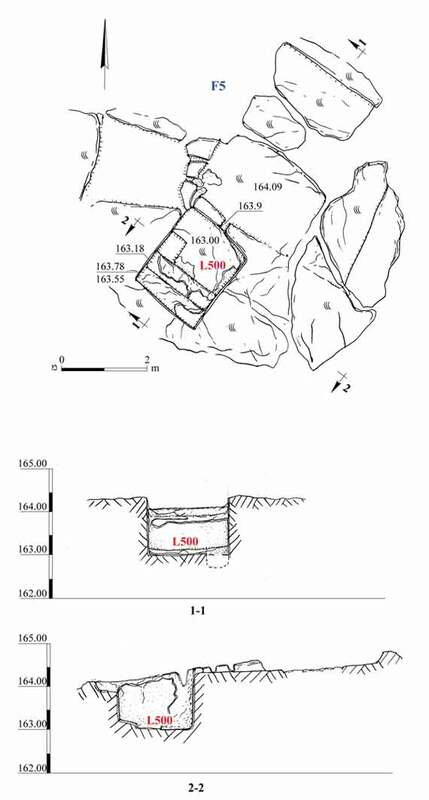 0.02 m, depth 0.08 m) was located adjacent to the southern side of the vat. 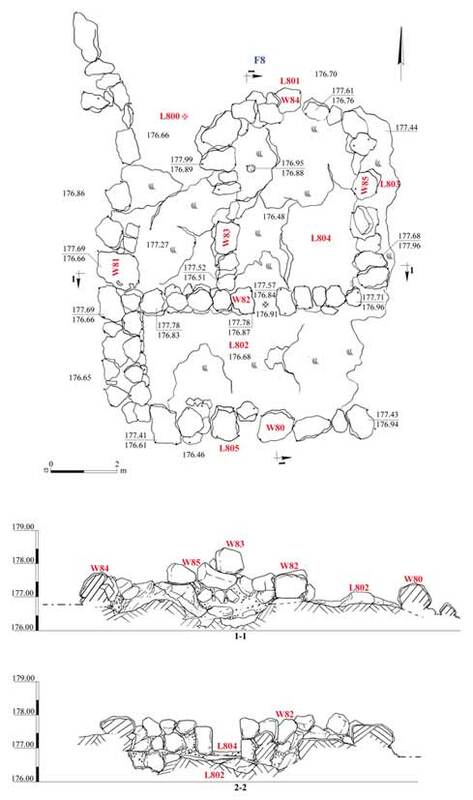 Burial Cave F4 was exposed c. 30 m east of Winepress F5 and it had a rock-hewn courtyard (2.10–2.30×2.50–2.55 m; Fig. 14). In the middle of the courtyard’s northern side was an opening to a burial chamber that was sealed with a square stone (c. 0.55×0.55 m); on the rear side of the stone was a dressed circular boss that blocked the opening to the burial chamber like a stopper. 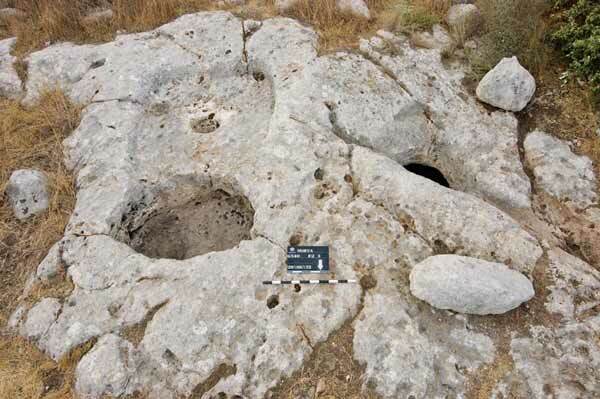 Three loculi with arcosolia that were sealed with a large stone surrounded by soil and small stones were in the chamber’s northeastern side. Two loculi sealed in a similar manner were in the chamber’s northwestern side and one sealed loculus and another one that was open were in its southeastern side. A small mound of alluvium that had penetrated from the chamber’s ceiling by way of a round shaft (diam. 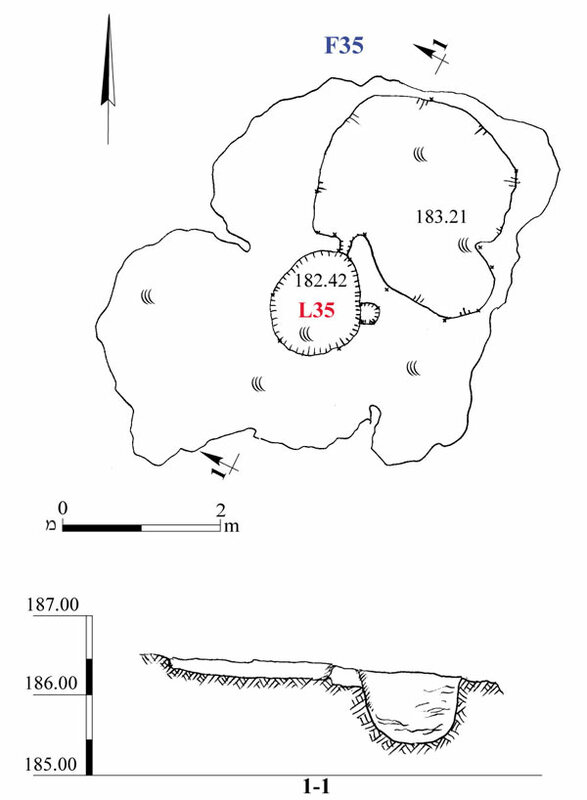 c. 0.6 m) was exposed in the western corner of the burial chamber. The cave (not excavated) was a typical loculus burial cave that is characteristic of the Early Roman period—the time of the Second Temple. Several potsherds from the Hellenistic period (fourth–first centuries BCE) were discovered on a level of tamped soil that apparently served as a floor, beneath the collapse in Room 800 of Building F8. They include a jar (Fig. 4:3) made of light gray clay with brownish yellow sides, mixed with large black and small and medium orange inclusions and a large quantity of small black grits; a cooking pot (Fig. 4:4) of orange-brown clay, dark brown on the outside, containing small black and white inclusions and has a short neck and a strap handle; a lid (Fig. 4:5) of orange-brown clay mixed with many small and large white inclusions, only the upper part of the lid was preserved and it has a knob that becomes wider toward the top for easy holding; a flask (Fig. 4:6) made of orange clay with a gray core containing many small white and several small red inclusions; it has an axe-shaped and everted rim and a relatively long neck with handles connected to it two thirds of the way up. Similar vessels were found at Horbat Qeiyafa where they date from the fourth–second centuries BCE (Sandhaus 2009:213–217, Figs. 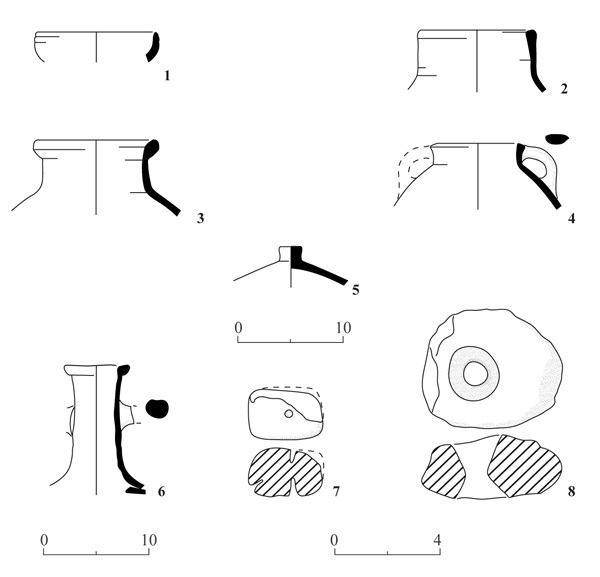 12.3.7, 10; 12.4.13; 12.6.16), at the City of David from the late second century BCE (Berlin 2012:215, Fig. 2.6.19) and at Dor from the fourth century BCE (Stern 1995:57, 58, Fig. 2.4.2). The fill in the collecting vat of Winepress F2 yielded a bowl (Fig. 4:1) of orange clay with many small black and white inclusions; a similar bowl from Gezer is ascribed to the first century BCE (Gitin 1990: Pl. 41:25); a jar (Fig. 4:2) of gray clay mixed with several small black and white inclusions; the surface of the vessel is orange-gray and it dates to the second–fifth centuries CE (Magness 1993:221–223, Form 3); and a body fragment of a vessel made of black clay (not drawn) from the Ottoman period. Two weights were discovered in Room 800 of Building F8: a ceramic weight in the shape of a truncated cone (length 0.07 m, width 0.45–0.55 cm; Fig. 4:7) made of gray clay mixed with large black and white inclusions, whose outside is a shade of orange; and a stone weight with an hour-glass shaped perforation (length 1.2 m, width 1.1 m, diam. of the perforation 0.02–0.45 m; Fig. 4:8). 2. Building F8, plan and sections. 3. Building F8, looking north. 5. Underground Cavern F3 and Winepress F2, plan and section. 6. Underground Cavern F3 and Winepress F2, looking south. 7. Cistern F7, plan and section. 8. Cistern F11, looking southeast. 9. Installation F23, plan and section. 10. Installation F23, looking south. 11. Winepress F5, plan and sections. 12. Winepress F5, looking southeast. 13. Winepress F35, plan and section. 14. 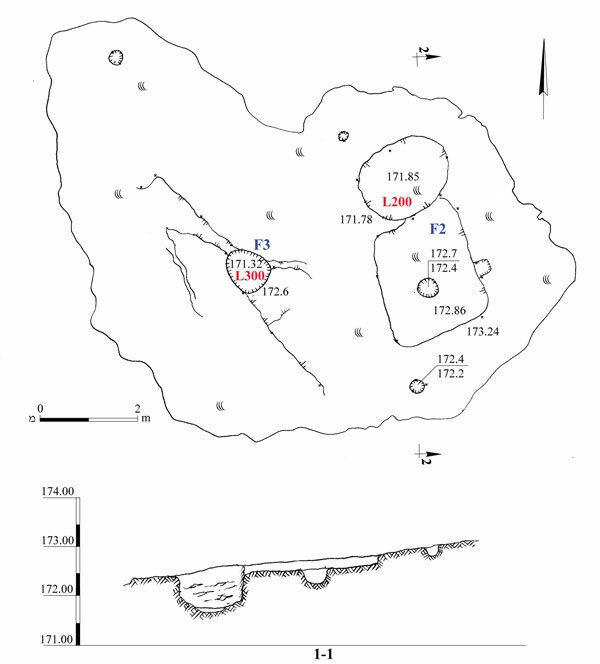 Burial Cave F4, plan.